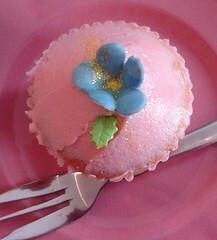 This tasty little specimen was courtesy of The Cupcake Parlour. Cupcakes at the Cupcake Parlour with its floral pretty decor was a girly counterpoint to attending Armageddon (the sci fi comic convention). Met up with Mo Mo and Tulip and we met various stormtroopers and comic book characters, saw the radioactive guy from Heroes and some Stargate chaps talk. If you want to make your own fancypants cupcakes, I’d recommend the Crabtree Bakery Cupcake cookbook. The Crabtree Bakery is in Melbourne and their pretty cupcakes are legendary. I’ve a soft spot for the musk flavoured ones.